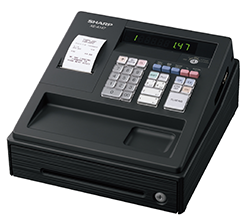 Install a SHARP Electronic Cash Register or Point-of-Sale terminal to achieve the sales efficiency your business has been looking for. 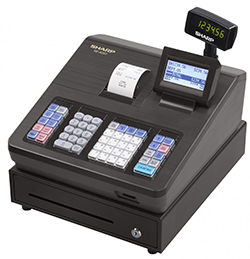 SHARP has been a mainstay in the Cash Register business for decades and their products can be found across the globe. The XE-A107WH is ideal for the small business as it is easy to install and easy to operate. Up and running with a minimum of programming needed to tailor the XE-A107WH for your business. The XE-A107WH has a large LED operator display and is fitted with widely spaced keys for comfortable operation. Attractively designed as a self-contained unit, the space saving drawer allows all cash to be safely stored in the three banknote and six coin compartment. The media slot in the cash drawer allows for quick and safe operation of the register while the key-activated mode switch promotes secure operation. A compact, low-profile design makes the XE-A147-WH (and XE-A147-WH) a real countertop space saver. The front locking cash drawer features three banknote compartments and a removable six-compartment coin tray. A slot accessible from the outside of the drawer provides a quick, safe way to put large banknotes and cheques into an under-tray storage area. The XE-A147WH / XE-A147BKis equipped with an SD card slot. SD memory cards of 4Gb to 32GB can be used to back-up various kinds of data, including daily sales and electronic journal. 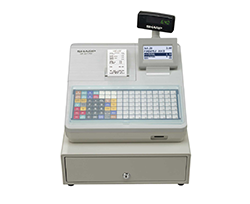 A variety of settings – store name and logo, department names, product names, sales tax rate and more – can all be configured on a computer and imported into the XE-A147-WH and XE-A147-BK quickly and easily via an SD card. The clear, backlit, 5 or 8 line *, 160 x 64 dot LCD operator display featured on the XE-A207W provides high visibility. It can display up to 20 alphanumeric characters, allowing clerks to view items, prices, and other information even in low-light environments. For better viewing, the operator display can be tilted anywhere from 25º to 70º. The XE-A207W also features a pop-up, rotating, 7-digit LED customer display, which can be adjusted to an easy-to-read angle, ensuring customer confidence. Note: SD cards are not included. Software for importing PC-configured data into the XE-A207W can be provided via your Sharp authorized installing dealer. Equipped with 2,000 PLUs (price look ups), the XE-A207W makes entering pricing information a snap. By simply entering the code for the items being purchased, you can total up sales with accuracy and speed. A total of 99 departments are also available, enabling you to easily track and analyse transactions by product type. The clear, backlit, 5 or 8 line *, 160 x 64 dot LCD operator display featured on the XE-A217 provides high visibility. 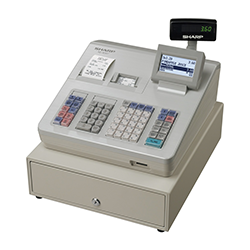 It can display up to 20 alphanumeric characters, allowing clerks to view items, prices, and other information even in low-light environments. For better viewing, the operator display can be tilted anywhere from 25º to 70º. The XE-A217 also features a pop-up, rotating, 7-digit LED customer display, which can be adjusted to an easy-to-read angle, ensuring customer confidence. The XE-A217 is equipped with an SD card slot. SD cards (4Gb to 32Gb) can be used to back up various kinds of data, including daily sales and Electronic Journal data. Data (CSV file type) can be saved to an SD memory card then managed on a computer via Excel or other spreadsheet applications. Also various settings can be configured easily by using an SD card. Parameters such as the store name and logo, department names, product names, sales tax rate and others can all be configured on a computer and imported into the machine quickly and easily with an SD card. Note: SD cards are not included. Software for importing PC-configured data into the XE-A217can be provided via your Sharp authorized installing dealer. 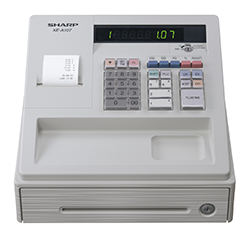 The XE-A217 features an Electronic Journal function that can store up to 9,000 lines of transaction data electronically, helping to conserve paper and reduce costs. For easy reference, the Electronic Journal View function displays transaction data from previous entries. Equipped with 2,000 PLUs (price look ups), the XE-A217 makes entering pricing information a snap. By simply entering the code or pressing direct keys for the items being purchased, you can total up sales with accuracy and speed. A total of 99 departments are also available, enabling you to easily track and analyse transactions by product type.